Last week I asked Mexico’s Secretary of the Economy, Ildefonso Guajardo, whether he fears that a Trump presidency will revive the anti-Americanism that was once a staple of Mexican life but receded to negligible levels over the past two decades. Surprisingly, his answer was all about a Monday Night Football game played less than two weeks after the election. 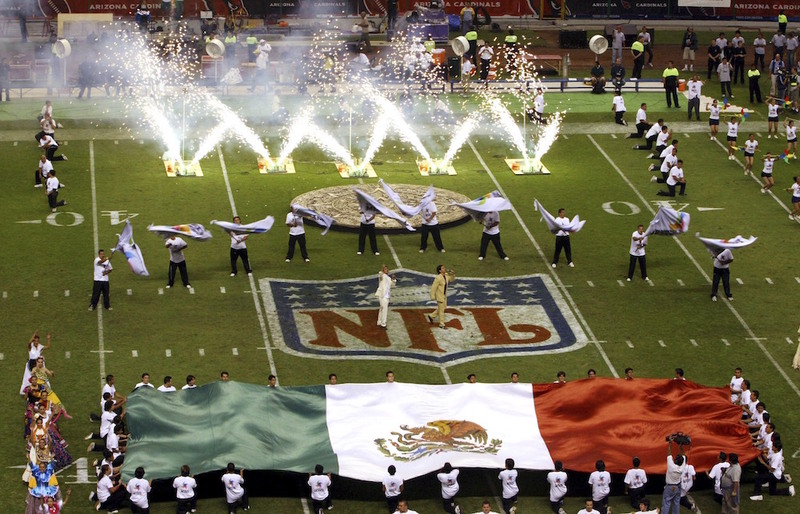 Namely, the first-ever regular season Monday night game played outside the United States, in Mexico City’s iconic Estadio Azteca. The Oakland Raiders beat the Houston Texans before a sellout crowd of nearly 80,000 fans, but what Guajardo found most telling was the moment before the game when the anthems of both countries were played. Guajardo explained that the NFL hesitated before playing the U.S. anthem in the Azteca for fear of how the crowd might respond, live on ESPN, but at the end of the day the league went ahead. And with the exception of a few scattered boos, the Mexican crowd’s response was gracious and respectful. Guajardo said this was a hopeful moment—that positive attitudes toward people on the other side of the border, often acquired through first-hand experience, can transcend political differences or efforts by demagogues to distort the essential truth of our mutually beneficial North American partnership. One can only hope. The stark reality is that Donald Trump won the presidency by running against Mexico. For a candidate with a short attention span and malleable policy stances, his views on Mexico throughout the long presidential campaign were remarkably consistent and sustained. Mexican immigrants are rapists who must be deported; the North American Free Trade Agreement is a disaster that must be torn up; U.S. companies opening plants in that country are treasonous; indeed, Mexico is so dodgy, we need to build a massive wall along the 2,000-mile border. And guess who’s going to pay for it? He’s so glad you asked. Forgive Mexicans if they end up taking it all a bit personally. Mexico has become a far more accommodating and friendlier neighbor —more of the middle class, democratic, open-to-the-world country Washington always wanted—in the two decades since NAFTA went into effect. But you hardly ever see this acknowledged in the U.S. media, or politics. Instead, in the Trump campaign narrative, Mexico was portrayed as the leading villain standing in the way of making America great again. One big question is whether Trump really believes his own anti-Mexico vitriol and is determined to act upon it, or whether he simply peddled it as part of a convincing “enraged populist on campaign trail” TV performance. On the other side of the border, a related big question is whether the damage has already been done, whether the mere act of electing such an anti-Mexican president will tarnish the United States in Mexican eyes for a generation to come. Keep in mind there are plenty of populist Mexicans politicians eager to match Trump’s xenophobic nationalism for their own gain, especially as Mexico gears up for its 2018 presidential election. One big question is whether Trump really believes his own anti-Mexico vitriol and is determined to act upon it, or whether he simply peddled it as part of a convincing “enraged populist on campaign trail” TV performance. In the meantime, I take heart at the outbreak of sports diplomacy like the Monday Night Football game. On the Friday night of election week, the U.S. and Mexican national soccer teams met in Columbus, Ohio for a World Cup qualifying match. This has become one of the most heated regional rivalries in the world’s leading sport, and a World Cup qualifier doesn’t require a seismic political event to ratchet up the level of intensity. It ended up being a more special night for Mexico, which won 2-1. Politics was a subtext of the match (I know of Mexican-Americans who usually root for the U.S. who couldn’t help but root for Mexico in post-electoral solidarity), but there were no chants about building a wall or mass deportations. In January, the Phoenix Suns are playing regular-season NBA games against the Dallas Mavericks and San Antonio Spurs in Mexico City. Much like the NFL, with its estimated 20 million avid fans in Mexico and talk of a possible franchise there, the NBA doesn’t see America’s neighbor to the south as the poor, conniving disaster of a country depicted in the recent election. Instead, American pro basketball is treating Mexico as a venue for future growth: a dynamic market with an expanding middle class and an appetite for American goods, culture, and entertainment. As do the U.S. cities these NBA teams represent, all of whom are organizing events alongside the games to try to attract more Mexican investment, trade, and tourism. Mexico is the second largest buyer of U.S. goods in the world, a market whose importance to most Fortune 500 companies cannot be overstated. These companies increasingly see North America as one integrated manufacturing platform too, a manufacturer that is more competitive with other parts of the world as a cohesive unit. Politicians bash companies like Ford for opening plants in Mexico, but 40 percent of the components of the goods imported from these plants are produced in the U.S., demonstrating how porous the border has become as an economic matter, and just how seamless the back-and-forth is within North American supply chains. One underappreciated danger for both American and Mexican workers is that companies will be spooked by populist protectionism and take more of their global manufacturing out of North America altogether. Back in the realm of sports diplomacy, one way for North Americans to transcend the ugliness of politics and assert a shared identity would be by hosting a World Cup together. The 2026 World Cup is the next one to be awarded, and the North American region is a strong contender, given the tournament’s traditional rotation among continents. Both Mexico and the U.S. are expected to submit compelling bids. There has also been talk throughout the year of a potential joint U.S.-Mexico bid; World Cups are typically played in eight host cities, and there’s the precedent of Japan and South Korea sharing the 2002 Cup. But that talk was followed by speculation that Trump’s election makes a joint bid less likely. It would be a shame to abandon the idea on account of politics. Quite the contrary: A shared North American World Cup (can we include Toronto too?) is needed, now more than ever. *Photo by Marco Ugarte/Associated Press.